Poached eggs have always being a challenge to me. I used to follow my mom’s recipe – cracking several of them in a pot of salted and vinegary boiling water and simmering on low until the yolk is done. That was a disaster. I tried the tornado in boiling water method, which helped the egg white stay around, but I could only make one egg at a time. Then, one day, I was watching an episode of America’s Test Kitchen and they showed an easy, five-minute method, of poaching as many as eight eggs at the same time. This seemed easy enough, so I decided to give it a try. To my surprise, the eggs turned out just right. This success lead me to having poached eggs as a regular quick weekend lunch. And a side of greens or a crispy prosciutto peas makes the eggs even more delicious. Crack 2 eggs in the same cup (total of 2 cups). Make sure the yolks do not break. If a yolk breaks, discard the egg and crack a new one. Set the cups aside. Fill a large pan (yes pan, not pot) almost to the rim with water. Add the vinegar and the salt. Bring the pan to a boil. Remove the pan from heat. Pour the cups with eggs, at the same time, into the water. Cover the pot and let it stay for 5 minutes. Heat 1/2 of the olive oil in a non-sticking pan on a medium-high. Add the prosciutto pieces one by one making sure that they are not sticking together (do it in 2 batches if necessary). Set the heat to a low and crisp the prosciutto on one side for about 30 sec., then flip the pieces and crisps for another 30 seconds. Make sure the prosciutto is not burned. Place the crisps onto a plate lined with a paper towel and set aside. Do not clean the pan. Using the same pan from the prosciutto, heat the remaining 1/2 of the olive oil on a medium-high. Add the shallots and gently sauté them for about 1 minute. Add the thawed peas and stir. Cook for about 2 minutes stirring frequently. Add the lemon juice, stir and add salt and pepper to taste. Add the prosciutto crisps and toss gently. Check the eggs by gently touching the yolk with your finger. The yolk should be soft, but not runny (the egg white should not be watery). If the eggs need more time let them stay in the pan for an extra minute. When done, remove each egg with a slotted spoon, tilting spoon slightly to remove the excess water. Season with salt and pepper. 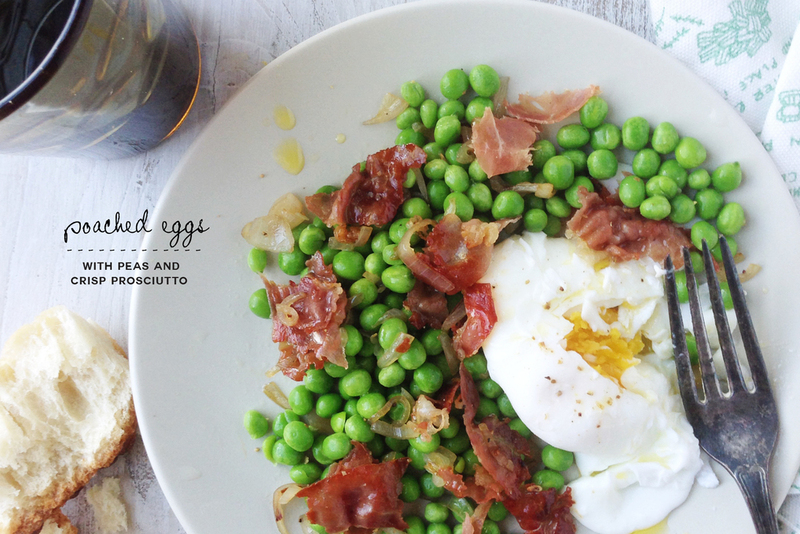 Arrange the plates by placing 2 eggs on each and add some of the peas with prosciutto on the side. If desired, sprinkle some grated Parmesan cheesecheese over the peas. Serve while still warm.